This book is awesome . It's gives a new limelight on Apple and it's foundations. How it all started and became world's renown brand . We have all read Steve Jobs story ,a great visionary , an artist but who made that possible!!? Steve jobs was good at visualizing the future , taking bold steps, marketing and branding but without technology Apple wouldn't be the top selling brand. Steve Wozniak was a major force behind this. He is a true engineer and best known . Simple philosophy of life , simple rules , content with what he had , generous ,humble and prankster. When you read his biography you shall understand how apple was founded and how the engineering worked. 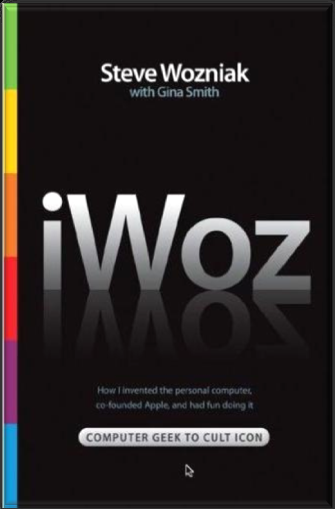 I give credit to Woz for Apple II , best gadget in those times. It was a revolutionary product . Engineering and technology was the base from where apple started. This book has given the full journey from Steve Wozniak's perspective and it's interesting. From how a genius like him is born , to pranks he played, technology he built , the inspirations , friends he made, parents support , split-up with life partner and so many aspects of life that go behind building up Apple. I truly admire Steve Wozniak engineering thinking , simple and elegant. I'm no Steve but i know the feeling :) . There are lot of photos in the book. Lot of narration of incidents , clarifications and confessions. For all those entrepreneurs and motivated engineers . This book is for you .